Of the countless games released across various formats every year, only one or two per decade are hailed by virtually everybody who plays them as one of the greatest games ever created. It’s a Nintendo game more than half the time, isn’t it? For example, Ocarina of Time is still talked about in hushed and reverent tones by legions of fans, even though the textures and harsh angled polygons haven’t aged particularly well. It’s in millions of people’s top five best games of forever lists. 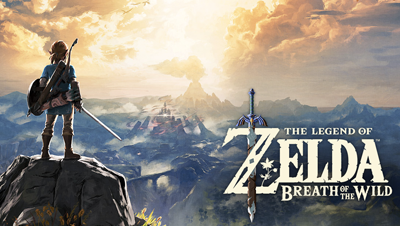 We can now add another Zelda title to these lists; Breath of the Wild is nothing less than an essential purchase. As Resident Evil 4 proved to be a fantastic game by tearing its franchise rulebook to shreds, so BotW forges its place in videogame history through several unexpected and brave decisions. No longer can Nintendo be criticised for playing it safe with their big-name franchises (a criticism I’ve never felt was fair or accurate anyway). This is the first Zelda adventure with (and this is not a comprehensive list) a jump button, weapons and shields that break, a huge variety in said weapons and shields, no traditional dungeons, the ability to climb any surface in the open world, a stamina meter, almost nothing in the way of instruction and guidance, the ability (and necessity) to create your own food and potions, and an open world that’s dynamic in a way that’s actually meaningful. At the beginning of the game you, as Link, wake from what appears to be some sort of deep sleep or suspended animation. You emerge from a strange apparatus that the game (initially) makes no attempt to explain. You’re prompted to collect your Sheikah Slate and then... you just do your thing. There are some basic clothes that you could miss on your way out, meaning you could start your adventure in just your pants. After what proves to be an extended introduction/tutorial of sorts (which doesn’t become apparent until it’s over), you’re given the paraglider and the ability to go anywhere in this huge open world that you like. You’re given the basic objective of ‘go get that bad guy’, but that’s it. What happens next is entirely up to you; and that’s the philosophy that drives the entire game. As Nintendo were keen to say before the game even released, you can theoretically go straight up to the game’s final boss, but this certainly isn’t advisable at first. You’ll be very poorly armed and far too easy to kill. Exploring the world and completing various tasks will reward you with more hearts, more stamina, better weapons and shields, new and better armour, the ability to enhance armour, warp points, and much more. It would be a mean-spirited reviewer indeed who spoiled anything of the story (which is subtly but expertly told) or, especially, what there is to be discovered in the world. BotW embarrasses every other open world game I’ve ever played by demonstrating how to handle the concept properly. Never, ever have I played a game in any genre that rewards curiosity, exploration, and experimentation with such consistency and charm. I love a good GTA as much as the next person, for instance, but Rockstar are as guilty as anybody else of boasting about huge open worlds and then cramming them full of bland, empty spaces with literally nothing to see or do in them. In BotW, animals to see (or hunt) and monsters to fight (or sneak up on, or avoid) are the least interesting things that you’ll find. If something looks odd in the distance, investigate; it’ll be worth it. If that mountain seems unclimbable, get closer. You can climb it, and there’ll be something worth the journey. If you notice a valley or cave you hadn’t seen before, wander down, and the game will make it worth your while. I’ve barely managed to scratch the surface of the game here, but that’s no bad thing. This experience thrives on discovery and wonder. Be it a Wii U or a Switch, this is a game worth buying a new console for. Breath of the Wild thing, I think I love you.